c1761-1834. He was probably born in Boston, Massachusetts, on 1 January 1761, the son of Benjamin Hallowell, a privateer captain who later became the Commissioner of the American Customs Board and died at York in Canada in 1799. His mother, Mary Boylston, was the second cousin of the second American president, John Adams, and his elder brother by fourteen years, Ward Nicholas Boylston, took his mother’s maiden name and returned to America in 1800 after twenty-five years abroad to become a significant benefactor of Harvard University. Raised in America, Hallowell’s early life was troubled due to the unpopularity that his father endured as a customs collector for the Crown, and when the revolution began in earnest the family was forced to flee to Nova Scotia in March 1776 before sailing for England four months later. As a result their property in America was lost. Eight months prior to their departure from Boston, Hallowell’s unarmed father had famously fought a street brawl with Vice-Admiral Samuel Graves, the British commander-in-chief in North America, during which he had broken that officer’s sword over his knee and given him a black eye. On 11 May 1777 Hallowell joined the navy aboard the Sandwich 90, Captain Richard Edwards, although he served time on various vessels operating out of Portsmouth whilst this ship remained at anchor. On 22 April 1778 he removed to the Asia 64, Captain George Vandeput, in which he went out to the East Indies to join Commodore Sir Edward Vernon’s command, being present at the action off Pondicherry on 10 August. The Asia returned to England in the early months of 1781 and Hallowell transferred to the Fortunée 40, Captain Hugh Cloberry Christian, sailing for the Leeward Islands where he joined Rear-Admiral Sir Samuel Hood’s flagship Barfleur 90, Captain Alexander Hood, on 31 July. On 31 August 1781 Hood appointed Hallowell an acting-lieutenant of the Alcide 74, Captain Charles Thompson, and on 5 September he served aboard her at the Battle of the Chesapeake. 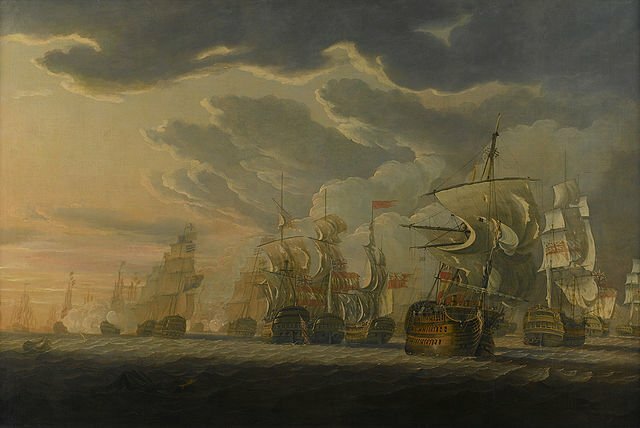 On 5 November he transferred to the Alfred 74, Captain William Bayne, in which he fought at the battles of St. Kitts on 26 January 1782 and the Saintes on 12 April, although his captain lost his life in a skirmish four days before the latter action. On 25 April 1783 Hallowell’s commission as a lieutenant was confirmed. From May 1784, and following the peace, he served in the Leeward Islands aboard the brig Falcon 14, Captain Velters Berkeley, prior to returning home on 25 July 1786. On 3 October 1787 he joined the Barfleur 90, Captain John Knight, later bearing the flag of his patron, Vice-Admiral Sir Samuel Hood, and during the Nookta Sound dispute in 1790 he was appointed with Knight to the Victory 100. On 22 November 1790 Hallowell was promoted commander of the sloop Scorpion 16, which he commanded off the coast of Africa from the autumn of 1791and later in the West Indies. After leaving this vessel on 1 October 1792 he went on half pay. In February 1793 he recommissioned the store-ship Camel 44 which he took out to the Mediterranean in May, and on 30 August he was posted captain. His initial appointment was as a temporary replacement for Captain George Keith Elphinstone of the Robust 74, this officer being ashore at Toulon during the occupation from August 1793, and he later commanded the Leviathan 74 in a similar capacity at Toulon during October for Captain Hugh Conway. After assisting at the evacuation of the port Hallowell covered for Captain Hon. William Waldegrave of the Courageux 74 when he returned to England with despatches in December. Having then failed to secure his own command he served in the Corsican campaign from February-August 1794 as a volunteer under the orders of Captain Horatio Nelson at the sieges of Bastia and at Calvi, where he was often present on the front line. Some time later in 1794 Hallowell was placed in temporary command of the frigate Lowestoft 32, and he commanded her in the Battle of Genoa on 13-14 March 1795 against the French. During this engagement he dared to engage the Duquesne 74, although he was obliged to send all the men below bar himself, the helmsman and a lieutenant, when the frigate drifted under her larger opponent’s guns. Such was the damage to the Lowestoft from the resulting broadside that she had to be towed into Leghorn for repairs. In May 1795 he rejoined the Courageux 74 after applying to Admiral Lord Hood for the command, and he fought in the Battle of the Hyères Islands on 13 July. Whilst he was attending a court martial in Gibraltar Bay on 9 December 1796 the Courageux was driven from her moorings by a violent gale and he was refused permission by Vice-Admiral Charles Thompson, the president of the court, to go to her aid because of the risks in so doing. Nine days later, on 18 December, the Courageux was destroyed on the shores of Africa with the death of four hundred and sixty men of her crew of almost six hundred. Hallowell fought as a volunteer at the Battle of Cape St. Vincent in 1797. Once more Hallowell found himself resigned to seeking service as a volunteer, this time aboard Admiral Sir John Jervis’ flagship Victory 100, Captain Hon. George Grey, in which he was present at the Battle of St. Vincent on 14 February 1797. Prior to the engagement he famously braved that stern officer’s rancour by characteristically slapping him on the back after Jervis had displayed his customary stoicism at the identification of a far larger enemy fleet. He was given the honorary task of carrying the duplicate despatches to England, and on 15 March was appointed to the eighteen-pounder frigate Lively 38 in succession to Captain Lord Garlies, in which he rejoined the Mediterranean fleet. Whilst cruising off Santa Cruz in company with the Minerve 38, Captain George Cockburn, their boats cut out the Mutine 14 on 29 May. At the end of October 1797 he transferred to the Swiftsure 74, which was one of the ships under Captain Sir Thomas Troubridge’s command that reinforced Rear-Admiral Sir Horatio Nelson’s expedition into the Mediterranean. On 1 August 1798 the Swiftsure was a late arrival into the fray at the Battle of the Nile, but in company with the Alexander 74 she plied such a fire into the French flagship L’Orient that the latter became ablaze and blew up. The Swiftsure suffered casualties of seven men killed and twenty-two wounded in the action, during which Hallowell happily supped ginger beer. Ten days later he captured the Fortune 18 in Egyptian waters. The Swiftsure remained off Egypt for the following eight months, on which station Hallowell occasionally provided dinner to the French officers ashore, but was hampered from taking any effective action against them by the poor conduct of the Turkish allies. This was exemplified on 23 October when an attack on Aboukir was cancelled due to Turkish weakness, and the situation was so bad that two days later he had to stop his men from assaulting their cowardly allies. On 20 March 1799 Hallowell rejoined Nelson off Palermo, and he subsequently served under Captain Thomas Troubridge during that officer’s excellent campaign in Italy from 29 June, for which he received honours from the court of Naples. 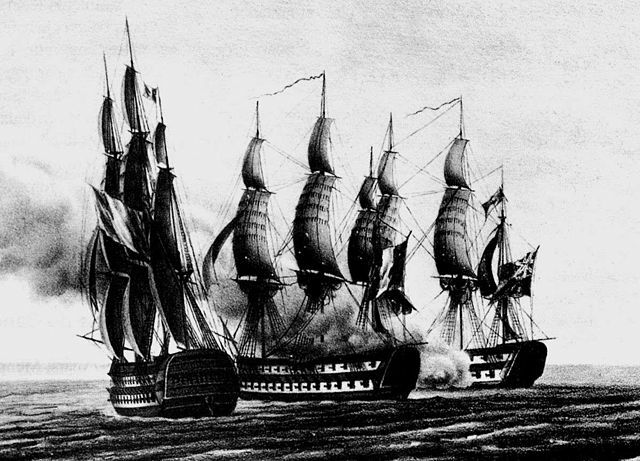 He was then sent to reinforce Rear-Admiral John Duckworth at Minorca following the breakout of the French fleet on 25 April 1799, and he enjoyed his share of the booty from the squadron’s capture of the Lima register ships Carmen 32 and Florentina 34 on 7 April 1800. In May 1800 the Swiftsure hoisted the flag of Rear-Admiral Sir Richard Bickerton, and after sailing to Egypt in November she was present at the landings of 8 March 1801. She remained off Egypt until the following June when Bickerton shifted his flag into the Kent 74, Captain Edward O’Bryen, whereupon she sailed for Malta. On 24 June 1801, whilst escorting the Maltese convoy, the Swiftsure fell in with the Brest squadron under the command of Rear-Admiral Honoré Ganteaume, which had left its port in the previous January, and having detached the convoy to safety Hallowell’s ship was intercepted and captured by the French after putting up a memorable fight. Displaying great chivalry, Ganteaume afforded Hallowell a guard of honour and allowed him parole. On 18 August a court martial at Port Mahon honourably acquitted him for the loss of his ship, and four years later he had the immense satisfaction to learn of her recapture at the Battle of Trafalgar. In January 1802 he was appointed to the Argo 44, and after she was fitted out at Woolwich he recomissioned her in September before raising his broad pennant as a commodore off Africa in December. On his return voyage to England he learned of the French declaration of war on 16 May 1803, so diverting to the Leeward Islands on his own initiative he put himself under the orders of Commodore Sir Samuel Hood at Barbados. He was thus present at the reductions of St. Lucia and Tobago in June before returning to England with Hood’s despatches, whereupon the Argo was fouled and damaged by a West Indiaman at Portsmouth in December. Hallowell retained the Argo for a secret mission to Egypt in February 1804 which involved intrigues amongst the Arab hierarchy, and the possibility of assisting various parties to power in order that they would side with Britain against France. On returning to England in June 1804 he commissioned the Tigre 80 at Plymouth, to which vessel many young men of standing, and indeed many of Irish descent, were posted. After joining Vice-Admiral Lord Nelson’s fleet in the chase of Vice-Admiral Pierre Villeneuve’s Toulon fleet to West Indies following its breakout on 29 March 1805 he was unfortunate to miss the Battle of Trafalgar on 21 October, the Tigre being one of the six ships detached under Rear-Admiral Thomas Louis to replenish at Gibraltar just before the allies came out of Cadiz. The Tigre remained thereafter in the Mediterranean where Hallowell was entrusted with a mission against the Turks in Egypt in order to provide some backbone to the Army. He was briefly superseded by Admiral Louis, but following that officer’s death he obtained the assistance of the army under Major-General Alexander Mackenzie Fraser, and successfully completed the capture of Alexandria, together with two frigates and a sloop in that port, on 21 March 1807. Unfortunately his exertions in ferrying the army across the Nile by the utilisation of dredged-up boats was negated by an appalling attack on Rosetta following the arrival on the station of his superior, Vice-Admiral Sir John Duckworth. In early 1808 Hallowell returned with his ship to England to regain his health, whereupon an acting-captain, Alexander Kerr, was appointed to the Tigre for several months. Suitably restored, he spent a short time off the Texel and in the North Sea, then in early 1809 rejoined Vice-Admiral Lord Collingwood’s Mediterranean fleet. Here he directed the cutting out of a French convoy from Rosas Bay after Rear-Admiral George Martin’s squadron had destroyed two French sail of the line near Cette on 25 October. In March 1810 he temporarily surrendered the command of the Tigre to Captain Abel Ferris in order to attend the sick Collingwood, but sadly his great friend died on 7 March. He was nominated a colonel of marines on 31 July 1810, and in November was sent to assess the capabilities of the Spanish patriots on the Catalonian and Valancian coasts before returning to Port Mahon in December. He remained in the Mediterranean until August 1811, and having been ordered back to England he arrived at Spithead, having given passage to the commander-in-chief designate of the East Indies, Rear-Admiral Sir Samuel Hood. Upon arrival he learned that he had been promoted rear-admiral on 1 August. In March 1812, whilst his impressive flagship Malta 80 was fitting out at Plymouth under the command of his brother-in-law, Captain Samuel Hood Inglefield, Hallowell took passage in the Royal George 100 to rejoin the Mediterranean fleet. He then transferred his flag to the Malta upon her arrival, whereupon he took command of the inshore squadron off Toulon. From the summer he assisted the British and Spanish armies on the Catalonian and Valencian coasts, although thereafter a very frustrating nine months was spent in the Bay of Alicante doing nothing, towards the end of which period he released his flagship and hoisted his flag in a smaller vessel. In June 1813 he superintended the transportation of the army to Tarragona, a two hundred mile voyage that did much to reflect his logistical brilliance. Sadly he was then mortified when the siege of that city was lifted and the army re-embarked within two weeks of their landing. 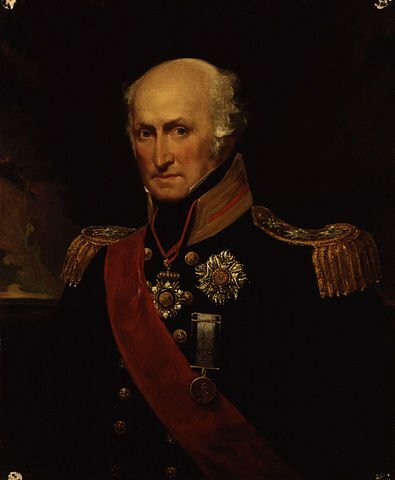 In May 1814 he replaced Vice-Admiral Francis Pickmore in command at Mahon, and shortly afterwards, upon the cessation of hostilities, he succeeded Vice-Admiral Sir Edward Pellew in command of the Mediterranean fleet. After visiting Barcelona, Leghorn and Palermo on government business he was unexpectedly replaced in November by Rear-Admiral Charles Penrose so that he could act as a witness on the court-martial into the conduct of General Sir John Murray at Tarragona. He then found on arrival in England that he would have to prosecute the general ten days later at Winchester. On 2 January 1815 Hallowell was nominated a K.C.B., and from 11 April he flew his flag on the Royal Sovereign 100, Captain Edward Brenton, shifting with this officer to the Tonnant 80 on 6 June. From 1816 until October 1818 he was the commander-in-chief in Ireland with his first lieutenant from the Tigre, John Tailour, acting as his flag captain, and he became a vice-admiral on 12 August 1819. In July 1821 he assumed the duties of commander-in-chief at the Nore with his flag in the Bulwark 74, Captain Sir Murray Maxwell, and then the Prince Regent 120, Captains William Parry and Hon. George Paulet, retaining this post until August 1824. On 28 March 1828 he assumed the additional surname of Carew upon inheriting from a distant cousin the large estate of Beddington Park near Sutton in Surrey, complete with mansion, leafy park and £12,000 a year. He was promoted to the rank of admiral on 22 July 1830, and was created a G.C.B. on 6 June 1831. Admiral Hallowell died at Beddington Park on 2 September 1834. At Gibraltar on 17 February 1800 he married Ann, the daughter of Captain John Nicholson Inglefield, and they had several children, the eldest of whom, Charles, joined Captain Thomas Hardy’s command in 1818 and served as his father’s flag-lieutenant during his time at the Nore. Ann Hallowell died in 1839. Three inches short of six feet, but with a muscular figure and a boxer’s features, Hallowell once quelled a mutiny off Cadiz by means of his own strength. Thin of hair, with penetrating bright grey eyes, he spoke many languages and encouraged his long-time purser, Archibald Murray, to build an impressive library. He was active, able, zealous, intelligent, unassailable, independent, mischievous and almost immortal, kind, humorous, brave as a lion, entertaining, cheerful, amusing and thoughtful. Unsurprisingly he was respected by officers and seamen alike. He was devoted to both Nelson and Collingwood, and he took their early deaths very badly. Just prior to the turn of the century, Hallowell had presented Nelson with a coffin constructed from the timbers of the French flagship L’Orient, a gift that was typical of his dark humour. After being chivalrously treated by the French following his capture in the Swiftsure he acted in a similar fashion after the Battle of Trafalgar by sending the captured French Captain Louis-Antoine Infernet £100 and a trunk full of clothing. This was typical of his generous nature and illustrated his general ambivalence to money; indeed when he was a flag officer he never accepted his share of freight money. He loved life, as exemplified by his assembly of an excellent and renowned band aboard the Courageux.